The travel booking process can be troublesome for travelers - but for Deem users, it won't be. When users need guidance, Deem HelpMe walks them through a step-by-step booking process. The feature offers a personalized customer experience, changing as the traveler uses it. Check ﻿out our new National Car and Driver in China. Traveling in China is filled with challenges - from securing reliable ground transportation to locating local addresses. Complicating travel bookings further - Chinese government regulations require non-Chinese visitors to book rental cars with a native Chinese driver, regardless of their trip duration. The integration connects traveler’s Facebook Messenger app to their Deem account. Once a traveler links their account, for any flight booked, the traveler receives a check-in reminder 24 hours before their flight. They can select to check-In from the app and will be directed to the check-in link for the airline they are departing on the next day. Travelers can also receive flight notifications and connect with support. More features to come! How much do you really know about artificial intelligence? 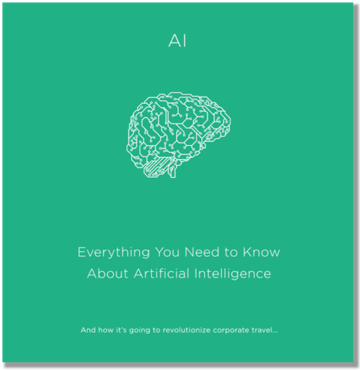 Learn how AI, machine learning, and other new technologies are changing the face of corporate travel. Read Deem's free ebook today and expand your technology lingo vocabulary! Take our personality quiz to find out what type of business traveler you are! Are you the Veteran, the Bedhead, the Tech Mogul, or the Anxious One? Find out by clicking below! 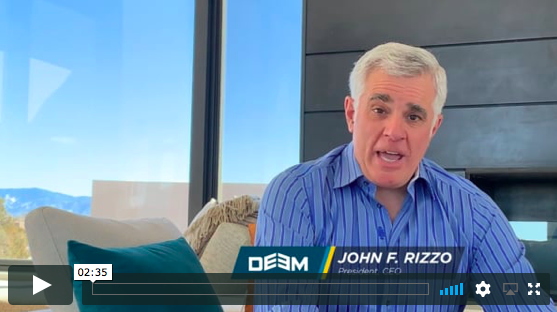 Take a look at how Plano Synergy is saving time, money, and stress by using Deem's Work Fource Platform. 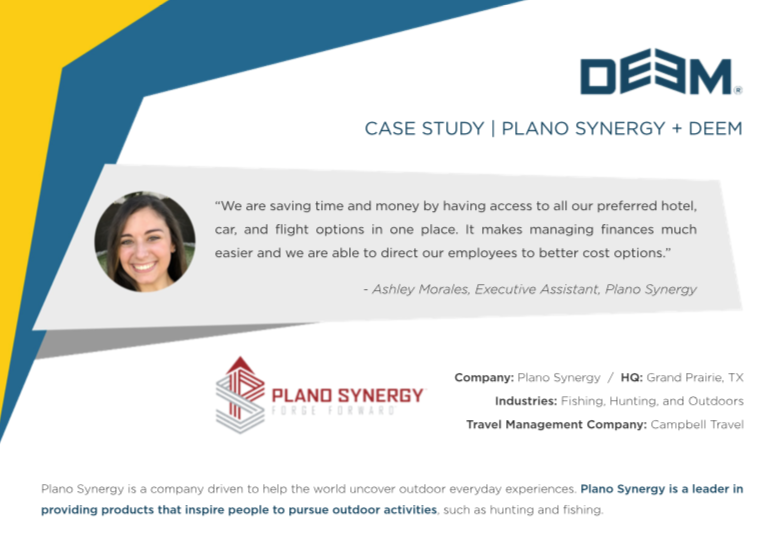 Plano Synergy needed a way to access preferred hotels and flight options as well as manage finances efficiently. With Deem, they were able to direct their employees to smarter, cost-effective options. Take a look at what Deem was up to in 2017. How does your travel program compare? Check out our infographic to see. How much do you know about the modern business traveler? Deem's ebook answers 5 questions that every business traveler has. Take a look at Deem's Phocuswright study about modern corporate traveler preferences and trends. For all of you Star Wars fans, or those who just want to travel smart - check out Deem's new ebook. Learn about new travel technology and how to take your travel booking experience to another level - or should I say, another universe. A CFO's top priority is managing company expenses, which can be frustrating. But what if he or she could enact a suite of cloud and mobile travel software applications that saves money and time, while offering choice? You can. Watch Infor + Deem's webinar on enhanced expense management in today's corporate travel world. CFOs control costs and drive revenue growth for their companies. Managing indirect spend and travel costs is a critical initiative for finance teams today, with implications across the organization. Check out the CFO.com x Deem webinar to learn better ways to control costs and drive revenue growth. Deem is now partnering with Avis India to offer car rental content to business travelers around the world. The new integration, available today, brings the Avis India Chauffeured Driver content to Deem powered travel platforms including Sabre, Apollo, GetThere, Egencia, and Deem Work Fource. 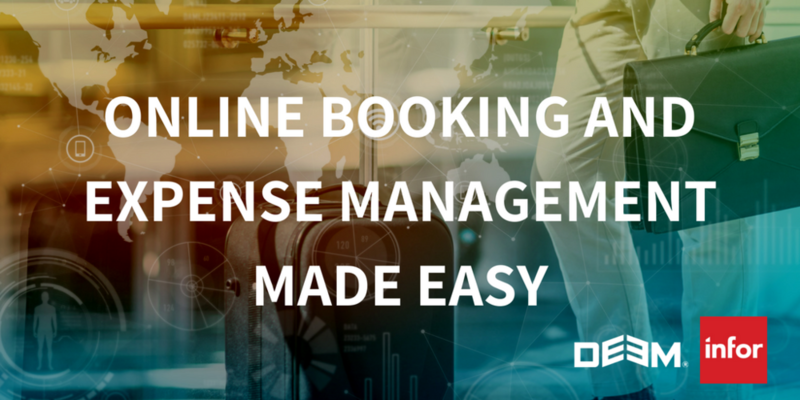 Deem launched a new platform, Deem Emerging, a new booking tool created for mid-sized corporations to manager their business travel better.